When you think of Indiana, you probably think of corn and cows, not hiking. You are mainly right, many Hoosiers are involved in farming, with livestock, corn and soybeans near most urban areas. But hidden within all the agriculture is a real gem. You could drive by, and not realize what’s actually within Turkey Run State Park. 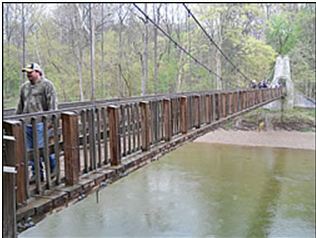 It’s located in western Indiana near Bloomingdale, and I have spent numerous weekends there hiking the trails, enjoying the scenery, and enjoying friends and family. The park itself is humongous, with 11 separate hiking trails to go on, canoeing, fishing, tennis courts and a swimming pool. Typically my family would go there on a Sunday afternoon, stay until the sun started to set and then head home. I would say that 90% of that time I would pass out on the way home from exhaustion after an action packed day. The entire park is wonderful, but I’ll stick to hiking and detail some of the trails that the park offers.